PROVIDENCE, RI – The city of Providence was recently honored as a “Playful City USA” by KaBOOM!, a national non-profit dedicated to saving play for America’s children. The recognition, which honors cities and towns that make play a priority, was due in part to Providence Children’s Museum’s growing advocacy for children’s free play over the past four years. To commemorate the designation, the Museum collaborated with Providence parks and recreation venues to plan the first Playful Providence weekend – a citywide celebration of the power of play being held September 7 – 9. The weekend begins with a Playful Providence Kickoff Celebration – Friday, September 7, 4:30 – 6:30 PM, downtown in Burnside Park. The celebration will feature a host of playful activities and collaborative art projects by community organizations, lively music from SuperChief Trio and the Brown University Band, and a short presentation featuring Mayor Angel Taveras, Superintendent of Parks Robert F. McMahon, Providence Children’s Museum Executive Director Janice O’Donnell and other speakers. 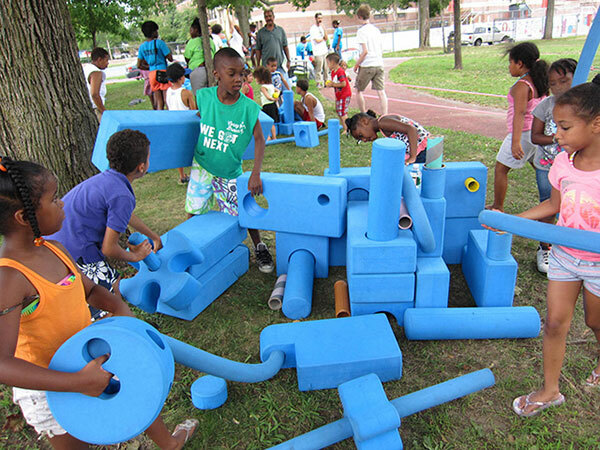 During the kickoff celebration, attendees can explore Providence Children’s Museum’s Imagination Playground – huge blue foam shapes that inspire creative play and building. Using oversized blocks, wheels, spools and tubes, kids and families construct castles, forts and vehicles and other imaginative structures. Playful Providence activities will continue throughout the weekend and will help families discover great places to play across the city. Events will be held at 21 neighborhood parks and 6 other play and recreation venues and include collaborative art, crafts and games, bubble blowing, music, dance classes and other playful fun. Visitors to Providence Children’s Museum can also explore Imagination Playground throughout the weekend. For a full listing of events, including activity details and locations, visit providenceparks.org. Playful Providence is planned by the Partnership for Providence Parks, a new group committed to providing kids and families with opportunities for structured and unstructured play in safe, healthy neighborhood spaces, in collaboration with Providence Children’s Museum; Providence Department of Parks and Recreation; Providence Department of Arts, Culture + Tourism; Providence parks groups; and other partners. Providence Children’s Museum – active hands-on fun, inside and out! The Museum is located at 100 South Street in Providence’s Jewelry District. September through March, open Tuesday through Sunday and Monday school holidays, 9 AM to 6 PM, and selected Fridays until 8 PM. April through August, open 7 days. Museum admission is $8.50 per person; always free for Museum members. Call (401) 273-KIDS or visit childrenmuseum.org.